Recently, I was lucky enough to travel to London and Paris. I’m not really sure what anyone else thinks of doing when they travel, but all I think about is the food. Once the travel plans were organised, I set out looking up where I wanted to eat. Which in the end, mostly meant I had looked up where the cake shops, bakeries, patisseries and tea salons were. The list I made for each city took us round to all the places we could get good food, cake, tea, kitchen and baking supplies and more cake. By the time we returned home I was really excited to bake something inspired by my travels. This recipe is from a book I bought before I knew I would get to go overseas. The book, ‘À La Mère de Famille’, is the cookbook from a confectionary shop/chocolatier in Paris of the same name. The shop, which now has more than one location in the city, was established in 1761. The original shop, on the Rue du Faubourg-Montmartre, was on my absolute must do list. As in, I wasn’t leaving the city unless we went there. I even walked past one of the newer subsequent locations of the shop and refused to go in because I had my heart set on going to the original one. I’m not really sure why I was so insistent on only going to the original shop. Maybe there’s just something special about going into a shop that has been there for so long. In any case, I’m glad we waited because it was very quaint and sweet. The window displays were enticing and once you were inside, it was easy to imagine the shop selling more or less the same things for all those years. They even had a separate booth for the cashier. All the pâte de fruits, caramels, chocolates and cakes were beautifully presented and I had a hard time choosing what I wanted. I settled on some chocolates for gifts, some marshmallows and some passionfruit caramels. So, once we were home, the chocolates were gifted away and the marshmallows eaten (I am still rationing the caramels because they are so very good), I decided I just had to make something from À La Mère de Famille’s book. Confectionary was ruled out due to my jet lagged state, so I settled on these plain but very pleasing biscuits. They are quite easy to make, and they make a fairly large quantity too. 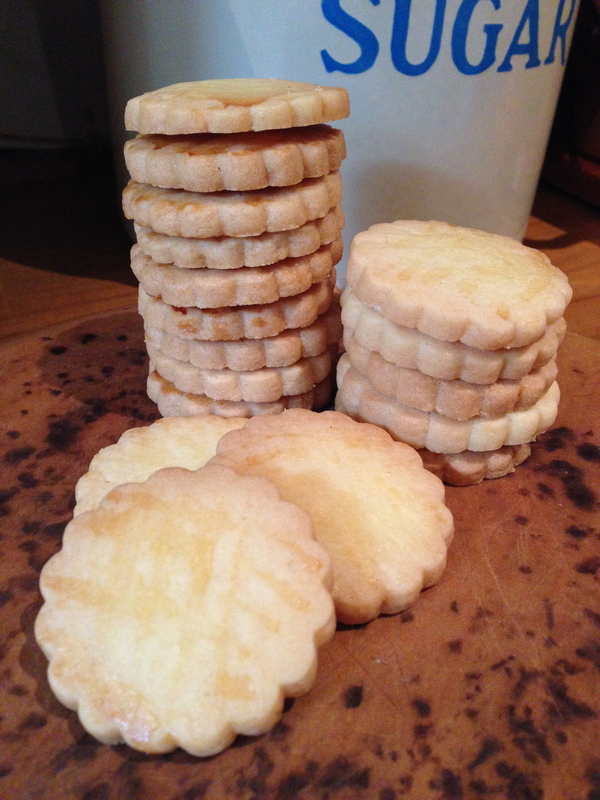 Everyone who ate them agreed they were nicer than shortbread, as while they are a butter biscuit they are lighter than shortbread and less crumbly as well. I gave some to my Grandpa and he told me, that not only did he like them, but had gotten up in the night to eat them! Using an electric mixer, combine the butter and sugar. Add the eggs, then sift in the flour. Lay a sheet of baking paper onto a bench or flat surface and tip the dough onto it. Cover the dough with a second sheet of baking paper and roll the dough until it is 2-3mm thick. Chill in the refrigerator for one hour. Preheat oven to 170 degrees Celsius and line three large baking trays with baking paper. Remove dough from fridge and remove top layer of baking paper. Cut biscuits out using a fluted 48mm pastry or biscuit cutter. Place evenly on trays. Brush with milk and push down lightly on each biscuit with a fork to create a slight indentation. Bake for 20 minutes, or until golden. I found I needed an extra 10 minutes or so until the biscuits were golden, but it will depend on your oven. Best stored in an airtight container. Makes at least 50 biscuits. Recipe from ‘À La Mère de Famille Artisanal Recipes’ by Julien Merceron p.214. The shop can be found at 35 Rue du Faubourg-Montmartre, Paris. À La Mère de Famille - 35 Rue du Faubourg-Montmartre, Paris. Originally Posted March 18, 2014.